Lantern is a US government-funded open-source proxy service developed by Brave New Software that came about in 2013 to bring denizens living under oppressive regimes an unfettered access to the Internet. It just so happened that when it started, major media outlets advertised it as a way for the Chinese Internet users to bypass the Great Firewall. So it became insanely popular among the Chinese users looking for a simple and free fix to the nagging censorship. 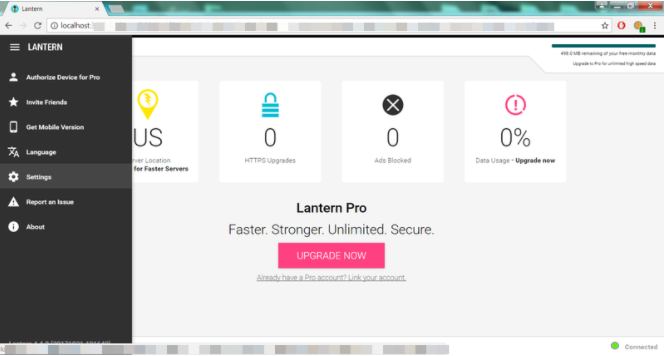 Lantern is not a VPN, but a proxy that works through an open-source peer-to-peer network. Some people use it to bypass local censorship, but it doesn’t protect you from targeted or mass surveillance. In fact, Lantern does quite the opposite by collecting an impressive portfolio of your browsing behavior and background. Using Lantern for privacy or anonymity is shooting yourself in the leg. You can have Lantern for free, provided you are fine with a 500 MB monthly quota. There are also two paid subscriptions you can only access from within the desktop app. 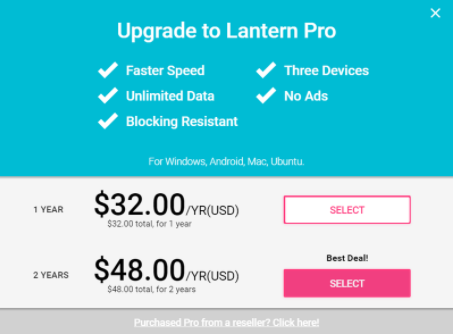 Dubbed as Lantern Pro, the yearly plan will only set you off $32 while the two-year plan is $48. No monthly or quarterly package - take it or leave it. Lantern promotes its free service with a surprising persistence, however. By making monthly subscriptions and short, paid trials unavailable, Lantern forces undecided users to try out the “perks” of their free proxy. 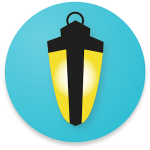 Lantern is a lightweight app available for Windows, Android, Mac, and Ubuntu. The installation didn’t take long, but the usage was quite different from your normal VPN. Upon launch, the app does not open a desktop client but launches your default browser with a spartan dashboard that lists your monthly quota, used bandwidth, your plan, and some basic stats like how many ads the app has blocked for you. The Settings are equally minimalist. 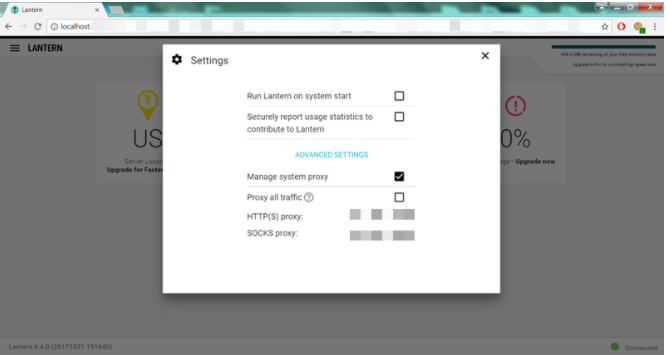 You can have Lantern run on system start, disable reporting of usage stats (enabled by default), and allow or disallow the app from managing system proxy. FAQs are also rudimentary. I hated that it opened my default browser since I only use it for personal browsing – certainly not for testing VPNs. So, Lantern profiled two of my browsers, great. There are no perks in Lantern other than its free peer-to-peer concept. It obviously targets users in China, and its primary function is to let you bypass censorship, and access sites like YouTube, Facebook, Twitter, Skype, WhatsApp or whatever social network that might be blocked in your region. In other words, it lets you access more spying and surveillance tools online. Additionally, Lantern decides for itself which sites to proxy based on prioritizing HD video streaming. Lantern encrypts your traffic in transit, but the company’s FAQs do not go into further detail as to what type of encryption is used. I was unimpressed with Lantern’s performance despite the speeds because privacy leaks left no doubt the service is to be avoided. 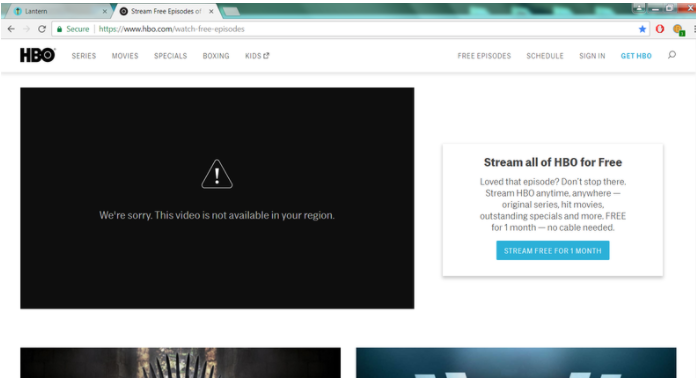 Since Lantern is meant for streaming region-locked services, I expected it to unblock some of them at least. 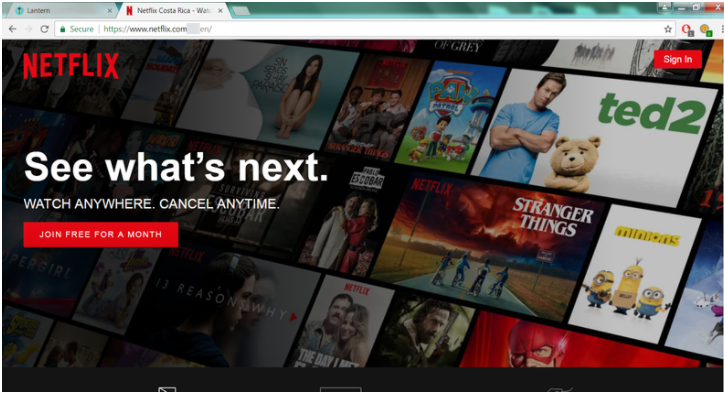 Alas, it failed to grant me access to Netflix US, Hulu, and HBO, at which point I was wondering how they manage to lure anyone into subscribing to a paid service. Is it that people just don’t like to read? Aside from the information you might willingly provide to the company, such as your name, email, postal address and phone number, profile picture and payment data, Lantern also collects an unprecedented amount of usage data. Lantern logs data about the pages you visit, your IP, device unique identifier or ID, device type, geo-location data, computer and connection or mobile network information, stats on page views, traffic to and from sites, ad data, referral URL, standard web log data and “other information,” as if that’s not enough. Lantern logs your IP address, access time and date, app features, pages viewed, “other system activity,” type of browser, third-party site or service you were using before interacting with Lantern. More so, Lantern openly admits to profiling. They collect information about you from other sources and combine it with the information they collect through their service. For instance, your account with a payment processor, and your Facebook or other social network accounts. Likewise, if you ever visit a website or use a service that relies on Lantern’s API, or if Lantern is using their API, the provider also adds that data to your profile. And the band goes on and on, go ahead and read the documents in full if you have the nerve. Lantern is a privacy nightmare. It’s not a VPN. But as a proxy, it doesn’t even deliver its advertised anti-censorship workaround. Steer clear.